As someone who spends their life creating patterns and working from them over and over again to make sure they are just right, the world of free form crochet is a little scary. I mean, I have always admired the organic, crazy, spontaneous freeform crochet creations as I scrolled through the feeds of fellow hookers but I always set out on a crocheting session with a particular design in mind. The thought of just randomly making stitches as and when the mood takes you. Well, to be honest I didn’t know if my slightly OCD-addled mind could deal with the randomness. Could I learn to let go and stitch with the flow? Fortunately, the rather lovely Dada Neon Crochet has very kindly put together a freeform crochet-a-long. The weeks are broken up into easily manageable chunks and the ideas for each week are definitely going to get the creative juices flowing. Seriously, check it out, it’s amazing. From making your hand print, to imagining your dream house to portraying your favourite song in yarn, it’s all there with handy ideas of how to go about stitching each task. Not exactly groundbreaking in freeform crochet terms but well outside of my personal comfort zone. So pretty proud of it all the same. So although I have a million works already in progress (who doesn’t?) 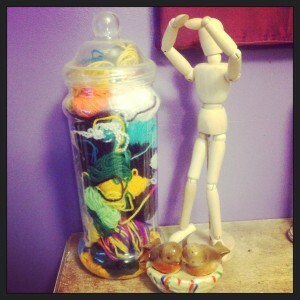 by learning to freeform crochet I am making some new friends and learning something new along the way. There is a great support network and even though we are all following the same instructions everyone’s interpretation is different so each design is totally unique. The best bit is that I have absolutely no idea what the finished piece will look like. Neither does anyone else. 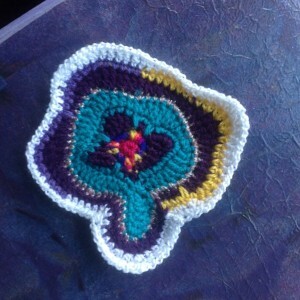 Posted in Blog, Freeform CAL and tagged Blog, Crochet, Freeform CAL, Stash busting.